One of the toughest things about starting a bartending set is collecting your barware. I’m going to simplify your search by sharing the places where I go to purchase gear. 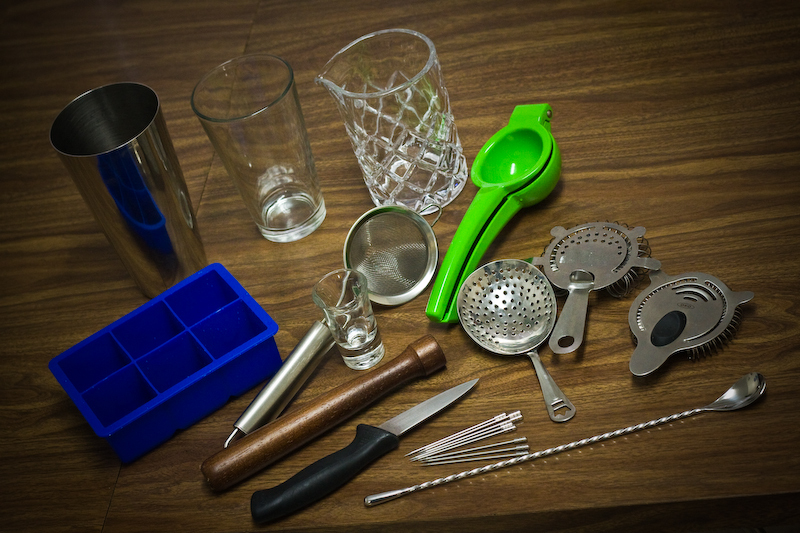 List of Items: Boston Shaker Set, Yarai Mixing Glass, Tovolo Giant Ice Tray, Strainer, Citrus squeezer, Shot Glass (for measuring pours, or you could purchase a jigger), Julep strainer, 2x Hawthorne strainers, Muddler, Paring knife, Metal picks, Barspoon. This is probably your #1 go to place for gear and ingredients. They have pretty much everything you need from glassware, bar gears, bartending books and an amazing (emphasis on amazing) selection of bitters. They often have seminars which are great for building knowledge and meeting people in the industry. Prices are pretty reasonable. People gotta make a buck to survive! I highly recommend this local shop. If you can’t find a certain liquor from the BCLB, Legacy will probably have it. For example your Martin Miller Gin or Luxardo’s Maraschno Liqueur. They also carry a wide selection of bitters on the left side of the wall when you walk in. Prices are usually a few dollars more than your BCLB as they are a private liquor store. Great thing is that they are open 7 days a week, 10 am to 11 pm. Also, they occasionally host a variety of events for wines, beers, and cocktails. If you like to ball out of quality crystals like me, Atkinsons is great. They have a huge selection of crystal glassware on the second floor. They also sell some quality bartending gear such as Japanese Yarai Mixing Glasses and barspoons. Spouts. This is probably your cheapest place to pick them up other than ordering a set online. For a bartender on a budget this is a great place to purchase discounted glassware and random items. This is where I picked up my citrus squeezer, strainer, and Tovolo Ice trays. I started this blog to share my journey and knowledge about the world of craft cocktails and liquors. First off I want to mention my personal favorites list of Cocktail bars in Vancouver. L’ Abbatoir (217 Carrall Street) – Head bartender, Shaun Layton. The bartenders at these bars serve cocktails on a different level than your typical restaurant/bar. Knowledge and skills wise. West (2881 Granville Street). Home to David Wolowidnyk, probably Canada’s top bartender. I had the honor of meeting him while he was working at West. Simply an amazing individual with extensive knowledge of everything to do with alcohol and more.